Facebook is no more a chat site where youngsters hang on with friends in their leisure time. It has emerged as a powerful marketing platform and everybody is rushing to have a so called strong presence on it. Do you really feel this way it is going to help you get a relevant identity on facebook? The answer is simply a big NO, because you need to avoid certain things that will dissolve your presence on such a crowded social platform. Remember you are on facebook for a purpose so behave the same way. Creating a beautiful facebook page is not enough; you need to learn certain basics of how to behave professionally on facebook. Research certain questions like – When to post? What to post? Which images will do well for your facebook business page design? Are the images relevant to the business, product line, buyers etc.? Should you reply a post, feedback, questions asked by buyers/visitors? What you shall avoid on facebook? All these and many more doubts we are going to discuss today in this blog. Read further. There is a difference between a facebook business page and a facebook profile. Maintain the difference. Note that facebook profiles are for general users and facebook business pages are for business houses, sellers, traders, marketers and business community at large. This might seem to be very basic and everybody is aware of it, but there still certain profiles that actually must be a business page. Google it you will find lots of them. Always monitor post and comments on your facebook business page. Do not avoid them. You might be wondering why such a silly discussion is on. It’s true, the discussions are silly but if these silly looking things are overlooked you will not get another chance to compensate yourself. No matter what is your business product or services, you need to constantly interact with your buyers active on the social media platform. If you don’t respond to the comments and post of your buyers/visitors, your inactiveness says – “I am least bothered about you”. To avoid the same follow the facebook link to study how to turn timeline on (https://www.facebook.com/help/168229546579373). Allow users to post and leave comments on your page so that you can review your performance. It is up to you whether to speak or let your buyers also speak. Make it two way traffic instead of one way. Let your users engage with you more rather than only you speak and others listen. Keep it simple, monitor all the post and comments on your page and regularly respond towards them. Stay active and engage more. Don’t mess with the Post; help your users with visual discrepancy by providing additional information relevant to the post. When you post a content on your page don’t forget to add some additional information that is related to your post, links, comment etc. This supporting info could be anything like a graphical presentation, infographics, statistical data, quotes, etc. keep in mind that facebook is highly searchable in prominent search engines. Also work out integrating your post with keywords so that they are visible when searched in the search engines. 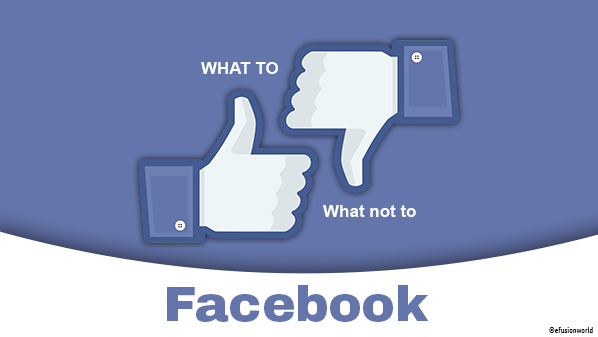 Read second half of the blog for more info on what and what not to do with your facebook business pages. You can visit us on www.efusionworld.com for social media, eCommerce & custom website solutions. You can email, call or chat live with our team of experts. What Is The Need of Facebook Fan Page For Your Online Business? Facebook is one great social network for individuals and business alike. With more active members than the population of some countries, it’s easily one of the best places for marketers and fans. A business must have a online presence as well interaction with its customers via social media design. Immerse your prospective clients in your brand and reach out to millions of potential customers. Facebook fan page is tremendously helpful as a means of communication between your organization and its worthy customers, basically all marketers need goal and a fan page serves the purpose best. Professional Facebook fan page design is very important for your business because that can help you to create traffic on your site. How Facebook fan page can help you to boost your business? A well designed professional Facebook fan page can help to get attention of millions of potential buyers. Facebook fan page gives you opportunity to communicate with its prospective buyers and making them interested in your product and services of the company. Potential Facebook and its network can help to advertise any business giving it maximum publicity to target audience. Not sure who your target market is? Facebook fan pages can help you figure out that. Each page keeps a statistics of who your followers are and who are participating. How your Facebook fan page to be “remarkable”? Face book page must be build attractively so that it can leave its effectiveness in the mind of your visitors. Convince your customers to visit company web site through attractive Facebook fan page design. In spite of attractive and innovative Facebook fan page features of the page, crucial information and rewarding incentives must be offered on Facebook page to develop the interest in the mind of your visitors about product and services.At whole, you can further enhance your brand. People do business with the people they trust, social media is all about building the trust over the time and Facebook is great way to do that.